The contributions of this volume are concerned with transport phenomena in multimembrane systems and in simple epithelia. 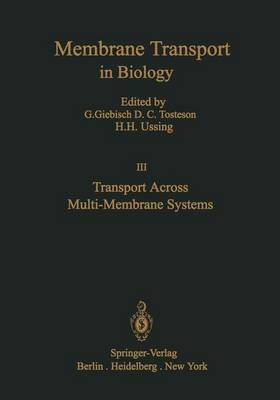 In addition to the very substan- tial progress that has been made in the area of transport of fluid and solutes across artifical model membranes in vitro and across simple symmetrical cell membranes, much has been learned from studies of transport phenomena in multi membrane systems of higher complexity to be reviewed in this volume. It should be recalled that many of the fundamental conceptual and methodological problems of transport physiology have been successfully approached and defin- ed by studying simple epithelia in vitro, and that the direction that research has taken has been affected in a major way by the cellular transport models that have evolved from this approach. Since then striking progress has been made in several areas. Not only have we been witnessing a keen and productive interest in the realtionship between fine structure and transport behavior in multimem- brane systems but significant advancements have also been made in defining individual active and passive transport operations, in analysing cell ion activities and transport pools, and in describing the differences in transport functions that underly the membrane asymmetry and cell polarization of cells subserving di- rectional transport.